Stow. 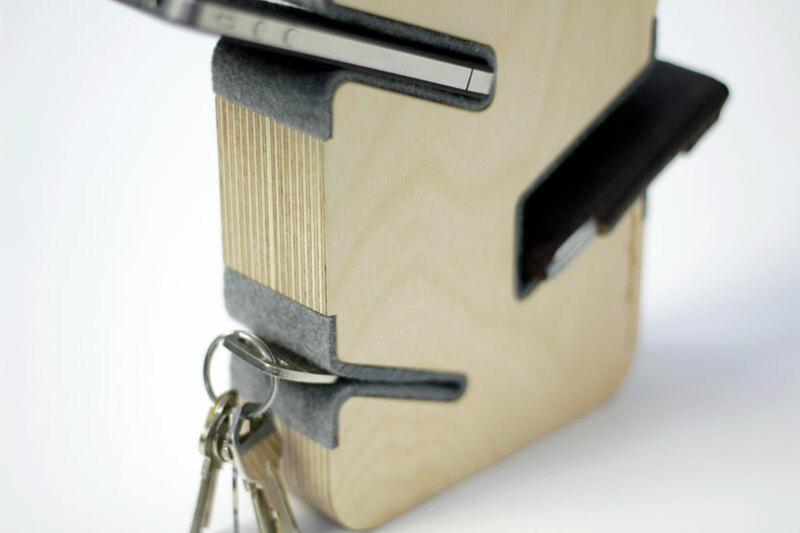 Caddy for keys, wallet and cellphone. Designers: Tim Wigmore, Rebeca Asquith and Maud Timmermans. 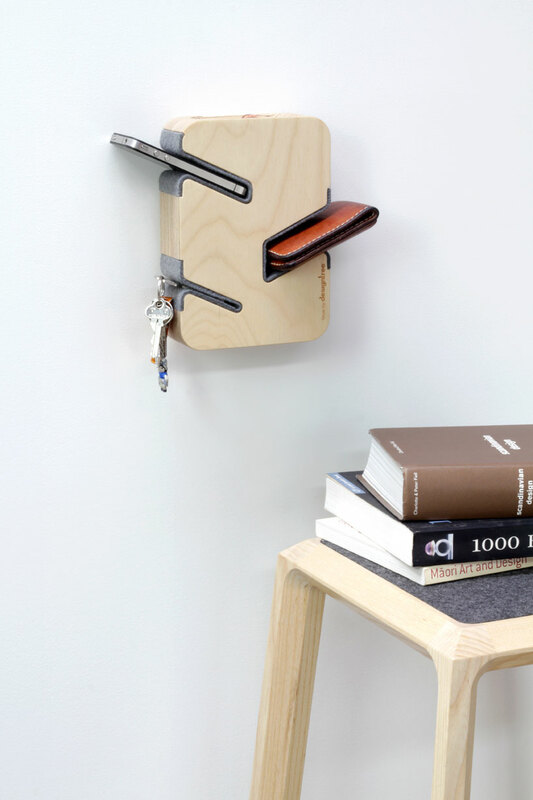 Working with Rebecca Asquith and junior designer Maud Timmermans we developed the Stow caddy as a response to a nagging problem that we encountered – where did I put my keys – has anyone seen my wallet? We desired to ditch the cellphone and empty the pockets of change as we transitioned from outside world to inside sanctuary, and wanted to have a specific place to put these so we remembered where they are. 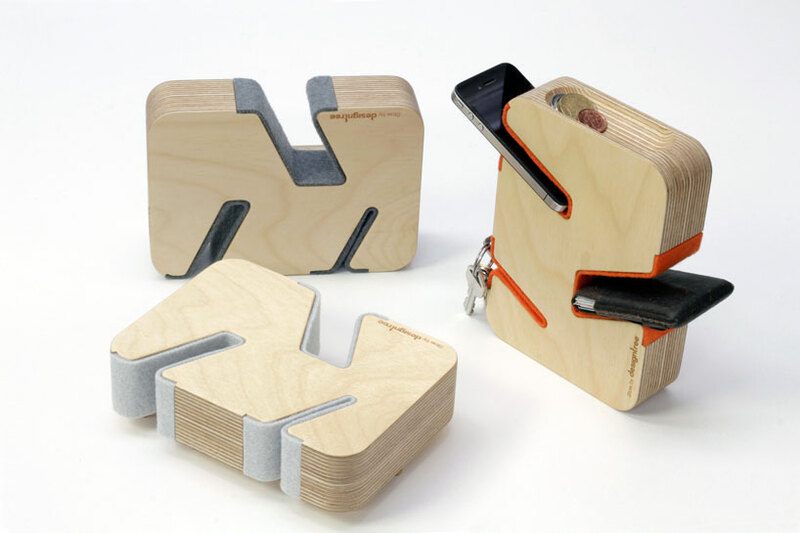 Initially designed as a way to change my own habit of losing the important trio (keys, wallet, cellphone), Stow evolved from 3 areas of interest; research into cellphone etiquette, reducing clutter, and looking at creative ways to re-use plywood offcuts and felt scraps from production of our other designs. 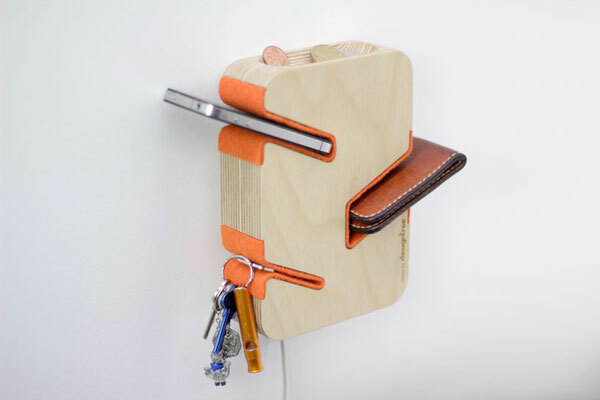 The result is Stow, designed to provide a stylish place to store your keys, wallet and cellphone, also allowing space for a charging cable and coins. Stow is designed to help create a more serene home environment, eliminating the frantic handbag diving, couch upheavals and pocket slapping that can ensue before departing the house. Built from FSC certified marine plywood with eco friendly plant based oil finish, Stow uses recycled PET felt to highlight the tree branch forms that inspires its shape and also to support and protect your important items. Natural timber, orange, light grey or charcoal felt.